The Chigorin defence to the Ruy Lopez comes about when black plays the closed 5…Be7 variation and play continues 6.Re1 b5 7.Bb3 d6 8.c3 00 9.h3 now black unleashes 9…Na5. The opening is named after the Russian player Mikhail Ivanovich Chigorin (1850 to 1908) who twice played Wilhelm Steinitz for the world title, losing on both occasions. The authors of the book are Dutch Grandmaster Ivan Sokolov and Spanish (appropriately enough !) 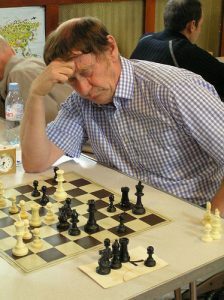 Grandmaster Ivan Salgado Lopez. Anyone playing the black side of 1.e4 e5 2.Nf3 Nc6 has to face the problem of how to get equality after 3.Bb5 undoubtedly the most challenging move. White’s normal strategy will often be to play for a kingside attack and therefore black needs to find a good defence that gives him equal chances and the opportunity to take over the initiative if white goes astray. The two Ivans offer a defence to the Ruy Lopez that seems to do that and one which is a lot more interesting than the (in my opinion) boring (according to many!) Berlin Defence. Firstly, I was surprised to learn that this opening variation was first played by (1910 World Championship Challenger) Carl Schlechter in 1902 and his opponent was Dr. Siegbert Tarrasch. 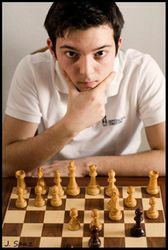 Chigorin himself played the defence twice but it was Akiba Rubinstein who made the opening popular playing it many times against world class opponents. Later on Capablanca, Lasker, Botvinnik, Euwe, Reshevsky and particularly Paul Keres all helped to make it a popular response to the Spanish Opening. 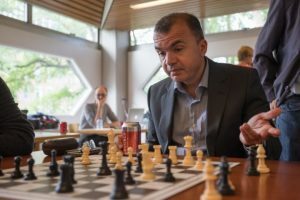 The book starts out by discussing early games and detailing middle game plans for Black. The first variation to be discussed in detail is 10.Bc2 c5 11.d4 Qc7 12.Nbd2 citing the stem game Lasker vs Tarrasch giving an excellent example of how black should play the position. A whole chapter then looks at the games of Paul Keres (most of which he won) however it does not include his famous game v Robert James Fischer (Zurich 1959) which is nevertheless analysed in another chapter : Fischer won that historic encounter. 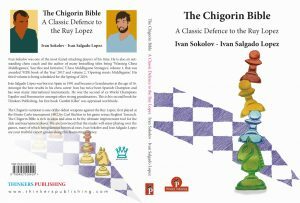 An attractive (and unusual ) feature of this book is that it also points out best lines for White to play rather than simply evangelizing the Chigorin Variation from Black’s perspective. An example of this is when black chooses 11…Bb7 over 11…Qc7 and after 12.d5! it is difficult for black to activate the bishop or the knight on a5. A better 11th move for Black is Nd7 which features in several games. Here again the author’s point out that 12.d5 is playing into blacks’ hand as he plays Nb6 intending f5. A better try is 12.a4 as a number of high level games demonstrate. The latter part of the book discusses much theory and sums up which lines are promising for each player and which are to be avoided. Summing up, I would say that this is an excellent book and any player studying it is likely to be better prepared than their opponent for sure. a great review my Colin! More from him please.